What was Popular Sovereignty and how did it affect the issue of slavery? The idea, or doctrine, of Popular Sovereignty was used by the framers of the United States Constitution as a founding principle of the government asserting rule by the people. The idea of Popular Sovereignty was also cited in the years leading up to the American Civil War asserting the right of the people living in a new territory to decide by vote of their territorial legislature whether or not slavery would be allowed. The idea of Popular Sovereignty was therefore used in debates concerning the slavery extension issue in new territories and states (refer to the 1858 Lincoln-Douglas Debates). Franklin Pierce was the 14th American President who served in office from March 4, 1853 to March 4, 1857. One of the important events during his presidency was the Popular Sovereignty and Slavery extension issue. The Popular Sovereignty and Slavery debate began in 1846 following the Annexation of Texas and the Mexican-American War which had had highlighted the issue of US Territorial Expansion and the question of whether slavery should be permitted in new states. In less than 100 years treaties had made by the United States acquiring new land and extending US territory from the Atlantic to the Pacific coast, as indicated on the territorial expansion map. The Popular Sovereignty and Slavery doctrine was first proposed in 1847 by Vice President George Dallas as a political policy that would allow the American settlers of new federal territories to decide whether to enter the Union as free or slave states. The idea was taken up by Lewis Cass in his 1848 presidential campaign causing a split in the Democratic party, which led to many anti-slavery Democratic politicians to join the Free Soil Party. The Popular Sovereignty and Slavery doctrine was then incorporated in the Compromise of 1850 which had been drafted by Henry Clay and Democratic Senator Stephen A. Douglas of Illinois. The Compromise of 1850 was an attempt to defuse the 4 year confrontation between the free states of the North and the slave states of the South regarding the status of territories acquired during the Mexican-American War. The Compromise of 1850 allowed California to be admitted as a free state and the admission of New Mexico Territory and Utah Territory with slavery was left to popular sovereignty. Popular Sovereignty was an important feature of the 1854 Kansas-Nebraska Act which was drafted by Stephen A. Douglas and created the territories of Kansas and Nebraska and opened new lands for settlement. The Kansas-Nebraska Act allowed white male settlers in Kansas and Nebraska to decide, through popular sovereignty, whether they would allow slavery within each territory. The Kansas-Nebraska Act effectively repealed the Missouri Compromise of 1820 that retained the balance between slave and free states admitted to the Union. The Kansas-Nebraska Act and the doctrine of Popular Sovereignty and slavery divided the country and pointed the nation towards civil war. The Popular Sovereignty and Slavery issue exploded with critics of the doctrine calling it "squatter sovereignty." Violence broke out between proslavery and anti-slavery factions and reached a state of low intensity civil war and this disastrous event became known Bleeding Kansas. The issue of Popular Sovereignty and Slavery led to a turmoil in US politics. The Free Soil Party and the newly formed National Union Party emerged as the new Republican Party in opposition to the Kansas-Nebraska Act. The goal of new Republican Party, that was based in the north, was to stop the expansion of slavery. The info about the Popular Sovereignty and Slavery provides interesting facts and important information about this important event that occured during the presidency of the 14th President of the United States of America. The Popular Sovereignty and Slavery issue were the subject of the what would become known as the 1858 Lincoln and Douglas Debates. Lincoln and Douglas contested the Illinois Senate seat. Abraham Lincoln challenged Stephen Douglas to debate the Popular Sovereignty and Slavery issues with him before the people of Illinois. Stephen Douglas accepted the challenge and a total of seven joint debates were held in the presence of enormous crowds. Abraham Lincoln forced Stephen Douglas to defend the doctrine of of "popular sovereignty." Stephen Douglas responded by declaring that the legislatures of the territories could make laws hostile to slavery. This idea was opposed to the Dred Scott decision. 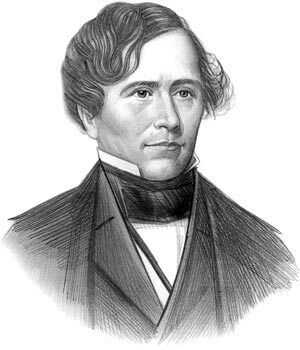 Stephen Douglas won the election and was returned to the Senate. But Abraham Lincoln was poplar with many people and the 1858 Lincoln and Douglas Debates had earned him a formidable, national reputation. Within six years Republican nominee Abraham Lincoln won the U.S. presidential election in 1860 gaining many votes due to his Popular Sovereignty and Anti-Slavery Debate. Following his election several southern states seceded from the Union and the establishment of the Confederacy unleashed the Civil War of 1861 - 1865. The issue of Popular Sovereignty was one of the Causes of the Civil War. The article on the Popular Sovereignty and Slavery provides an overview of one of the Important issues of his presidential term in office. The following Franklin Pierce video will give you additional important facts and dates about the political events experienced by the 14th American President whose presidency spanned from March 4, 1853 to March 4, 1857.